Written by Catherine Saxelby on Wednesday, 10 February 2016. I’ve never seen so many nutrition claims on one pack before! Here in my hand is a bag of corn chips that has just about every Health Halo you can think of, starting with ‘certified organic’ (not simply ‘organic’); and working through ‘gluten-free’, ‘no flavours or colours’ and a long list of ‘Free-froms’ (e.g. no dairy, sugar, soy, wheat, egg or MSG). But once you strip those away, what you’re left with is a packet of plain old corn chips with just as much fat, as much saturated fat and with the over-processed drawbacks of any other corn chip. First of all, what is a Health Halo? And a Health Halo is “proven to cause people to eat more food than they intended, such as eating two organic cookies when you would normally only eat one non-organic cookie.” There’s the word ‘organic’ again. The product I alluded to in the intro is the Thomas Chipman range of chips, specifically their Blue Corn and Quinoa chips, which you may have stumbled over. Here are the 11 Health Halos I counted on a pack of Thomas Chipman organic, gluten-free, blue corn and quinoa corn chips. I’m sure there are plenty of other Health Halo foods out there but this one manages to slap more nutrition claims on one pack than any other I’ve noticed. And it really annoys me because it appears to ooze old-fashioned wholesome goodness, when it’s not. Who is Thomas Chipman himself? Is he the founder of this range? It’s such an arresting name and one in stark contrast to most other popular corn chips. Looks like a hard-working English baker. In fact he’s a made-up persona. His story is listed under “Fact or Fiction” on the Chipman website. The clever use of an old-fashioned pack design with illustrations of etched whole cobs of corn complete with outer leaves and an 1880s Englishman on the front in limited palette. I’m no graphic designer but this design screams ‘genuine’ and ‘olde worlde’ to me. The usual marketing line. All plain corn chips can claim this as they’re made from corn (maize), oil and salt. Just three ingredients. Not a scrap of wheat, barley or rye in sight, so they are NATURALLY gluten-free. So are potato crisps. Doesn’t make them ‘good for you’. Not just organic, but certified organic. With the official organic ‘bud’ logo in small on the back and a certification No: 10504. But this doesn’t take away the fact that they're salted and have a high fat level. How ‘natural’ is blue corn? Isn’t any corn ‘natural’? This word is so bandied about on processed packet foods that it’s really meaningless. Just about any food can say it’s natural. There’s no definition of natural in Australia and even in the US the USDA has steered clear of the whole headache too. 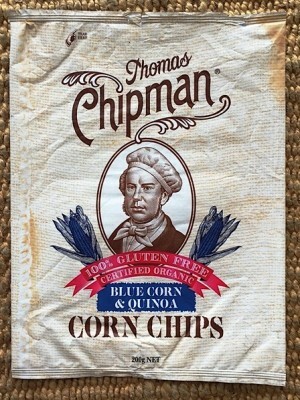 Other variants in the Thomas Chipman range also sport similar Health Halos such as parsnip chips, beetroot chips and – this one tops them all – Ancient Grains corn chips (a mere 5 per cent of chia, linseed, brown rice flour and quinoa). organic quinoa – black, red and white 5%, sea salt. Ok this would be a nice change from regular oil if it weren’t for the fact that the oil is palm olein oil and the chips have 35 per cent total fat. Around the same as any other corn chip or potato crisp. Nothing special here. At least the pack tells you it’s palm oil. There’s a qualifier with a further Health Halo on the oil, as it says the oil is RSPO (which stands for Roundtable on Sustainable Palm Oil) and is identity-preserved and fully traceable. Yep there’s only corn, oil, quinoa and salt. Any plain unflavoured corn chip could say they have no colours or flavours. These additives come when you buy the Sour Cream or Nacho Cheese variants. If you want to avoid additives, one of my steps is to avoid buying such flavoured snack foods. See my post on 4 Steps to Avoid Additives here. Hello – got a pleasant surprise – these had only 236mg of sodium per 100 grams which is low. Much lower than other brands which range from 350 to 600mg. Every allergen you can think of and more. Including the onion and garlic that are banned on FODMAP-friendly diets. That should keep a lot of folk happy. That old chestnut. Well, it must work. No need for any chemical preservatives, as salt and a low-moisture product do the job of preservation for you. Not to mention the extra-thick, foil-lined pack which keeps the chips fresh for at least 6 months. 11. There are logos for Halal, Kosher and Gluten-free as well Made in Australia. It’s pretty well got them all. These look impressive. Finally there’s the huge price - at over A$6 a pack! These are “aspirational chips” and not for the budget-minded. That price tag works out to be a whopping A$31 per kilo. This too propels the chips into a “you get what you pay for and therefore must-be-better-for-you” category. With all 11+ Health Halos, you’d be forgiven for thinking there was something extra good about these Thomas Chipman chips. But in the end, they’re just corn chips with 35 per cent fat, of which 16 per cent is saturated (as they’re fried in palm oil, not monounsaturated sunflower oil as many popular chips are) and 68 per cent carbs. Think of them as another highly-processed, salty, snack food that is all too easy to overeat. This 200g pack is meant to serve four but I bet two people would finish it off. And that’s just before dinner. Don’t be fooled by these 11 Health Halos. Look at what they’re NOT saying. For example, if something shouts ‘fat-free’ then check out the sugar content. If it says ‘no-added sugar’, look for fruit juice concentrate in the ingredients and check out the total sugars in the nutrition info panel. Look at what a product actually is not what it says it isn’t. In this case it is fatty, salty and carb-laden – as are most chips. A product to be eaten sparingly because, despite the Health Halos, it’s not going to improve your health.